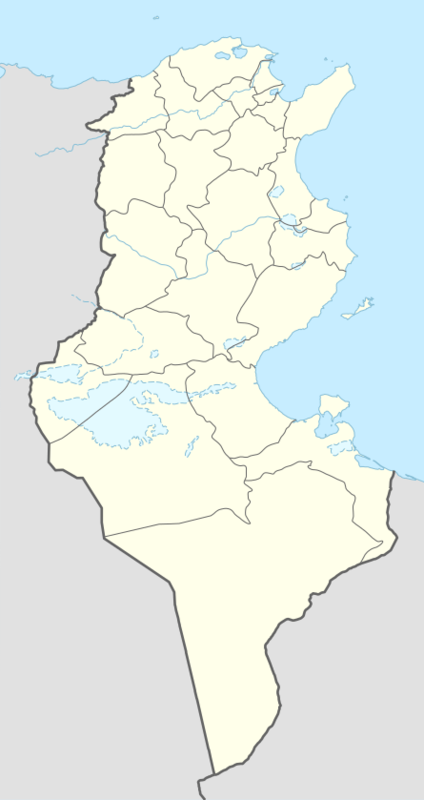 Gabès (Tunisian Arabic: ڨابس‎ Gābis), also spelled Cabès, Cabes, Kabes, Gabbs and Gaps, is the capital city of the Gabès Governorate in Tunisia. It lies on the coast of the Gulf of Gabès. With a population of 130,984, it is the 6th largest Tunisian city. Takapes, the ancient name of Gabes, is a Numidian (Berber) toponym. Later, the prefix "Ta" (meaning "to" in Berber) was dropped, and the place became known as Kapes. As in Arabic the sound /p/ is unknown, Kapes became known as Kabes, and later known as Gabes. Gabès is the ancient Tacapae or Tacape (Τακάπη in Ancient greek) or Tacapes of the Roman province of Tripolitania. Strabo refers to this city as an important entrepot of the Lesser Syrtis. Pliny (18.22) remarks that the waters of a copious fountain at Tacape were divided among the cultivators according to a system where each had the use of the water during a certain interval of time. The Tabula Peutingeriana shows Tacape between Marcomades and Sabratha. Tacapae became a Christian bishopric that, no longer being a residential see, is included in the Catholic Church's list of titular sees. Caius or Gallus, legate of the bishops of his province to the Council of Carthage in 525. 1928 map of Gabes under the French. 7th century: The Umayyad Caliphate conquest. Muhammed's companion Sidi Abou Loobaba Al'Ansarey settles in Gabès. 1574: Gabès becomes part of the Eyalet of Tunis after the Ottoman conquest. 1881: Gabès comes under a French protectorate. 1940: Following the Fall of France, Gabès comes under German control. 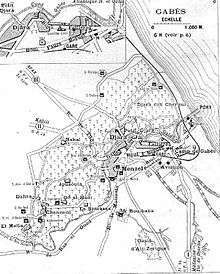 1943: Gabès returns to French control with the help of the British (in the Mareth Line). The operation results in serious damage to the city infrastructure and in the defeat of Hitler for the first time in history. 1945: The rebuilding of Gabès starts. 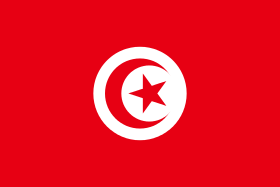 1956: Gabès reverts to Tunisian control with the independence of Tunisia from the French. The fast-growing numbers of factories has resulted in fairly serious pollution of the area and of the Gulf of Gabès. In recent years the government is working on new programs and laws to decrease the amount of pollution. Gabès – Matmata International Airport is in the city. Gabès will soon be upgraded with one light rail system under the number 7 that will run from the railway station to the port of Gabès. Featuring rolling stock made by Alstom, Gabès will receive 15 new train sets. Gabès is terminus of a narrow gauge 1,000 mm (3 ft 3 3⁄8 in) branch railway from the capital, and is the nearest railway station to the Libyan border at Ras Ajdir. Gabès has also one of the biggest ports in Tunisia; it is used usually to ship the mineral products from the city of Gafsa. Gabès has a semi-arid climate, characterized by a hot and dry season and a cool and arid season. Gabès is famous for its traditional Souqs in Jarah; it is known also for its attractive beach and the unusual seaside oasis (Gabès is located on the coast of the Mediterranean Sea). The best parts of the beach are in the south of the city (Road to Djerba). The best one is the Lemawa or Lemaya beach. The government is planning to build a tourist zone there in the coming years. Gabès has a unique feature in the world, in this city you find the mountain, the sea, the oasis and the desert. The streets of Gabès come alive at night during Ramadan, where sook's (shops) are open on the streets and parties happen almost everyday in the night during Ramadan. The most visited place in Gabès is the town Matmata. This site was added to the UNESCO World Heritage Tentative List on May 28, 2008, in the Cultural category. 1 2 "Recensement Général de la Population et de l'Habitat 2014 – Population, logements et ménages par commune et arrondissement". National Institute of Statistics. Retrieved 9 September 2016. ↑ "Gabès Climate Normals 1961–1990". National Oceanic and Atmospheric Administration. Retrieved January 24, 2015. ↑ "Gabès Climate and Weather Averages, Tunisia". Weather2Travel. Retrieved 19 July 2014. ↑ Professor Henry Louis Gates, Jr.; Professor Emmanuel Akyeampong; Mr. Steven J. Niven (2 February 2012). Dictionary of African Biography. OUP USA. pp. 89–90. ISBN 978-0-19-538207-5. Wikimedia Commons has media related to Gabès.